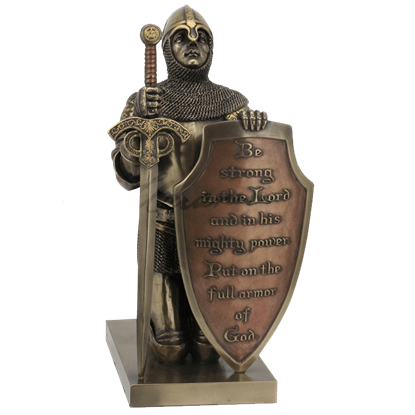 If you need an accent piece that combines style and meaning, then the Armor of God Statue could be the solution. 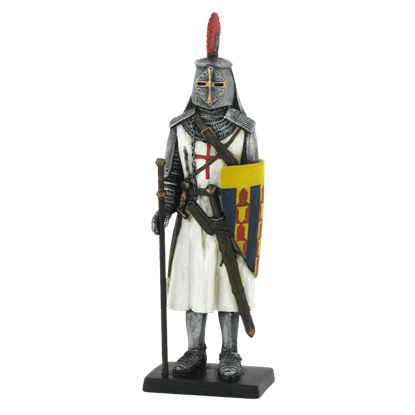 This impressive figurine is sure to enhance the look and feel of any room while providing you with spiritual strength. 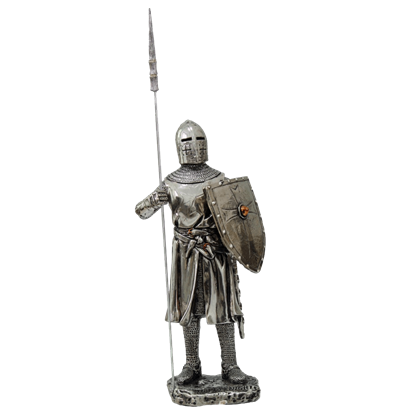 Perhaps your home or office has been needing some medieval inspiration like the Armor with Pollaxe Statue. This elegant and powerful accent can easily become the focal point of any room that needs a fresh decoration. 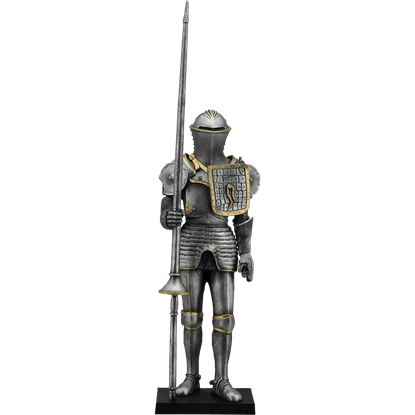 Welcome an element of nobility and duty into your home with the Armor with Tassets and Partisan Statue. This regal figurine will become a treasured addition to the current decor of your home or office, so buy your very own model today. Not all knights and crusaders favored the sword and shield as primary weapons. 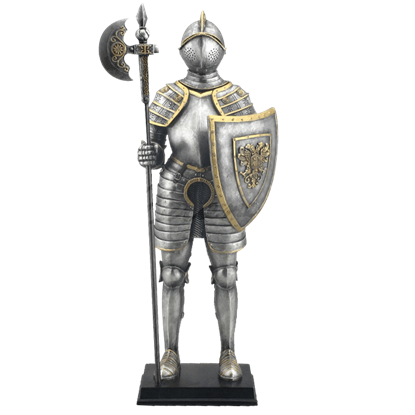 This Armored Crusader - Holding Shield and Axe Statue depicts a knight who favors the utility and the power of the axe when it comes to combat. 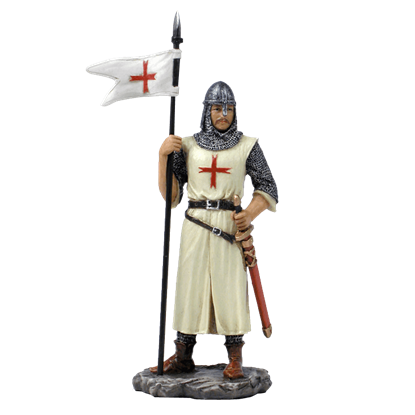 During the course of the Crusades, many knights banded together to form knightly orders and wore the same standard into battle. 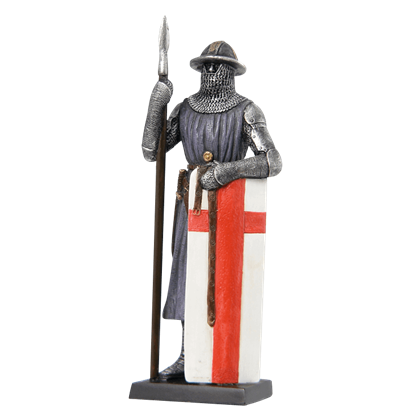 The Armored Crusader With Flag In Right Hand Statue depicts a knight with ties to a well-known order. A knight must be prepared for any event in battle. This Armored Crusader with Staff and Striped Shield Statue looks to be well-prepared, as he is fully armored and armed, complete with two additional weapons. One would think that in armor, a knight would lose their noble bearing, but that just is not true. The Armored Knight With Chainmail Coif Helmet and Sword Statue is proof that even in full war gear, a knight is a noble force to behold. Generally, knights were more easily identified than other warriors. They carried better equipment and wore better armor. As this Armored Knight with Feather Plume Helmet Statue shows, they also wore more ornate helmets, too. A knights life was not all about war. Sometimes, a knight lived for when he could participate in a joust. 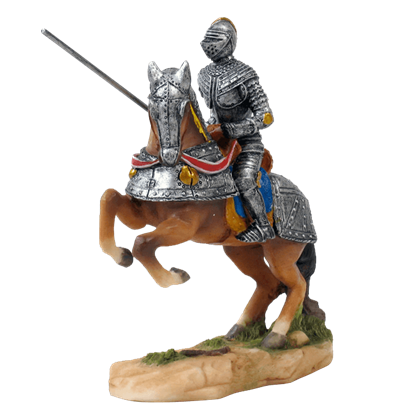 This Armored Knight with Jousting Lance on Rearing Horse Statue depicts a knight as he gets ready to charge the lane. 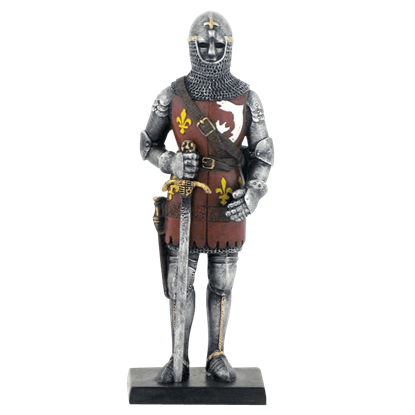 Soldiers came in all shapes and forms during the medieval era. Some fought from a distance, while others fought on horseback. Some, like in the Armored Soldier with Spear and Long Shield Statue, fought in a ground-based melee. Jousting was one of the favorite hastiludes in the middle ages. Knights and members of royalty donned heavy plate armour to demonstrate their courage and skills. 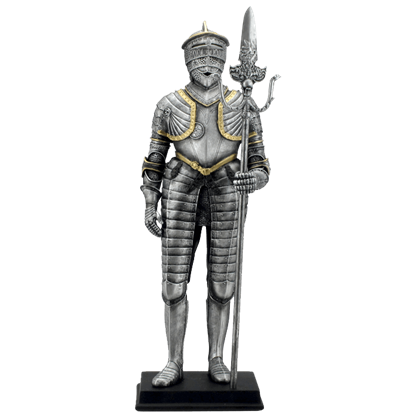 This Armour with Lance Statue adds tournament flair to any room. 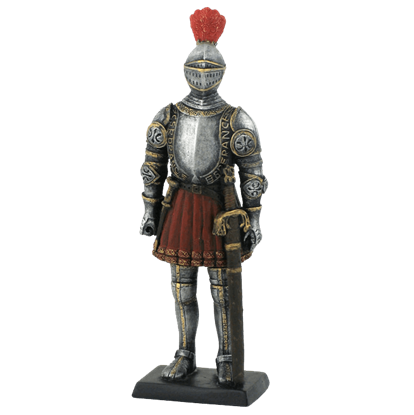 The Armoured Crusader Knight With Spear Statue depicts a classical interpretation of a medieval warrior standing on a base modeled on rocky ground. 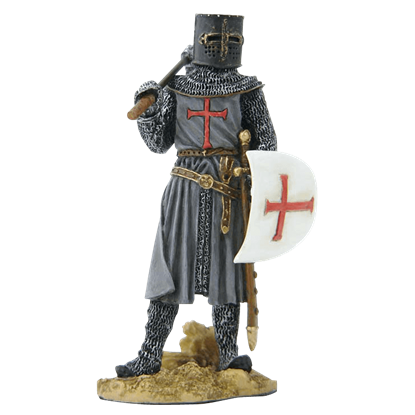 This knight wears the garb and armour of a Crusader and carries a spear at his side.